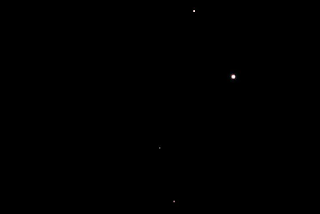 Well, you should know that this morning your humble servant sacrificed his sleep and put himself in harms way in the observatory parking lot to provide for you with a photo of the conjunction of planets Jupiter, Venus and Mars. Ok, ok, it's what I like to do, but how would you like to set the alarm yourself and get up in the dark to see the early morning sky? that course even though I entered it just as the course was ending. The timing didn't matter though and I enjoyed learning about x-Ray astronomy and used DS-9 software to review Chandra Observatory images and determine the orbital characteristic of binary neutron stars. It was really neat just to use the light curve, not an image, from Chandra and be able to see and calculate the rotation rate of the neutron star and the orbital period and distance to its companion star. Some objects we looked at include Cen X-9, Cas-A, and quasar 3C273. The last session I just saw from my other free online video course on Exoplanets described another method of detecting planets around other stars. Previous lectures had covered two methods to find planets called the transit method and the Doppler shift method. This third method is based on gravitational lending. 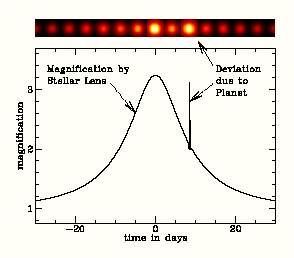 Now we have seen previous use of gravitational lending to reveal deep space objects lensed by foreground galaxies, but this new planet search method called microlensing is really neat. The method measures the magnitudes of millions of stars over a period of months to years and looks for characteristic changes in the star's magnitude. The change in magnitude that is sought is not the change due to some variable star physics, but due to microlensing. The microlensing occurs when, just by chance, one of the observed stars just happens to pass directly in a line of sight to another star in the background. When this happens the starlight from the background star is bent and deformed by the gravity of the foreground star. This causes a change in the magnitude of the light from the background star. Some changes in magnitude that I heard of were about 2-3 magnitudes. Check out the Internet image below which shows an example of microlensing. Because of the slow changes in stars positions the microlensing event is observed over periods of many days. Once an event like this is found, many other observatories are notified so the event can be tracked over its whole course of action. Even amateur astronomers have provided star magnitude data when the event was not visible from some of the big observatories. But wait, there is more. Look at the little peak that shows up in the lensed data. That little peak of short duration is attributed to a planet and its gravitational effect on the starlight from the background star. 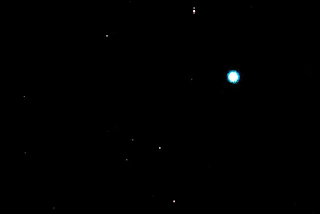 Note that this is not an image of the planet, but only its effect on the background star light. See how the optical image changes with intensity magnitude shown in the chart. Neat stuff. It does raise some interesting questions about the philosophy of science about the repeatability of experiments, though since the experimental observation cannot be repeated for that star. Ok, enough astrophysics for now, let's get back to this mornings photos. Did I mention that I had to set the alarm clock to get this image for you? The first image, taken at about 6:00 am shows the three planets in conjunction. The image was taken with 300mm telephoto. 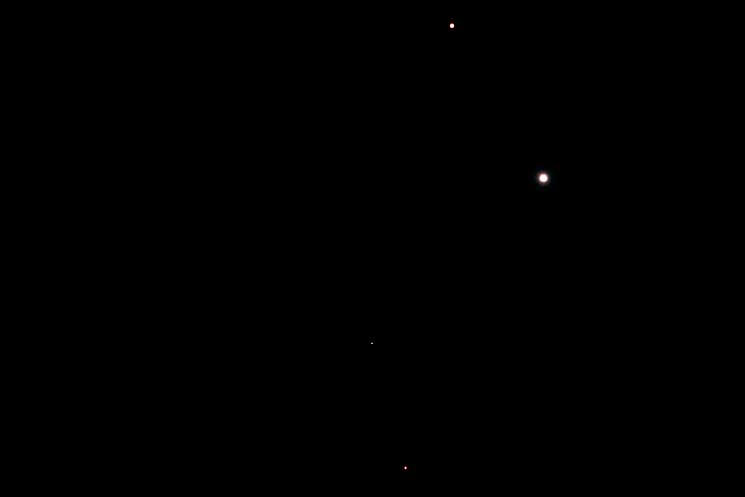 Jupiter is at the top of the image, with very bright Venus in the middle and dim red Mars at the bottom. The second image shows the same setup, but with enhanced brightness and contrast. 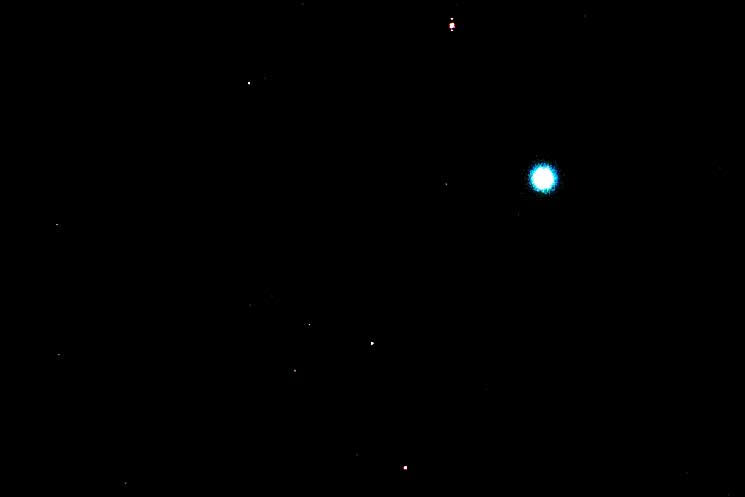 Look closely and you can see some of Jupiter's moons.